The quality and longevity of a crystal affect not only the accuracy of rate and thickness measurements, but more importantly the successful completion of the process being controlled. INFICON quartz crystals offer proven quality and reliability-proven by millions of successful process runs with a wide range of materials, applications and industries. Our 6 MHz crystals are used with all INFICON controllers and monitors. Our 5 MHz crystals can be used with 5MHz instruments only; and are not compatible with some INFICON instruments. The 6 MHz and the 5 MHz crystals are available in gold, silver or alloy electrodes and come in a variety of packages depending on your needs. The INFICON clean room quartz crystal package enables convenient dispensing of the crystals directly from the package to the sensor, minimizing operator handling and risk of contamination. To make the crystal package more cleanroom-friendly, we eliminated the paper and foam inserts and made the packages stackable for easy storage. Ask about our new 50 pack for customers with high crystal usage! 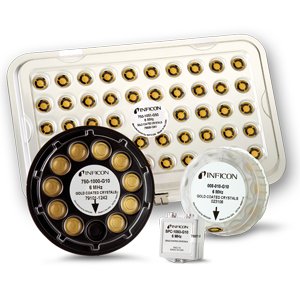 INFICON high temperature crystals are optimized to achieve high frequency stability at sustained high temperatures.